Notes from a town on fire. An eternal flame was kept burning inside the hearth of the Temple of Apollo at Delphi. A perpetual fire burned on the altar of the ancient Hebrews, to fulfill a biblical promise — that a fire shall burn forever and shall not be put out. They keep two flames burning in St. Petersburg to honor fallen soldiers, and in a Javanese village a flame has been burning for five hundred years, no matter how hard it rains. There are eternal flames burning all over the United States, in commemoration of Elvis or 9/11 or war, and there’s a hole of flames in Turkmenistan they call the Door to Hell. There’s an eternal flame down below, some say, raging beneath us all. 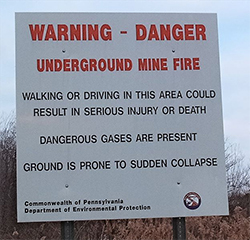 And in a vanished mining town in Pennsylvania, a fire is burning too.